Lots of scrappy stuff lately, I know, I can't help it, it's in my nature to craft. 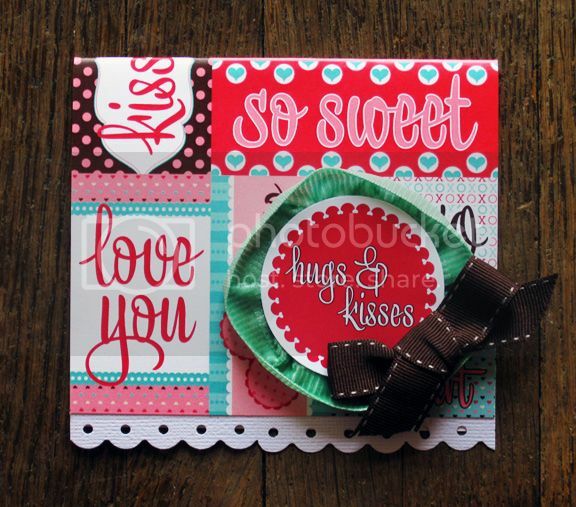 Here are my cards for the monthly challenge over on the Elle's Studio blog. 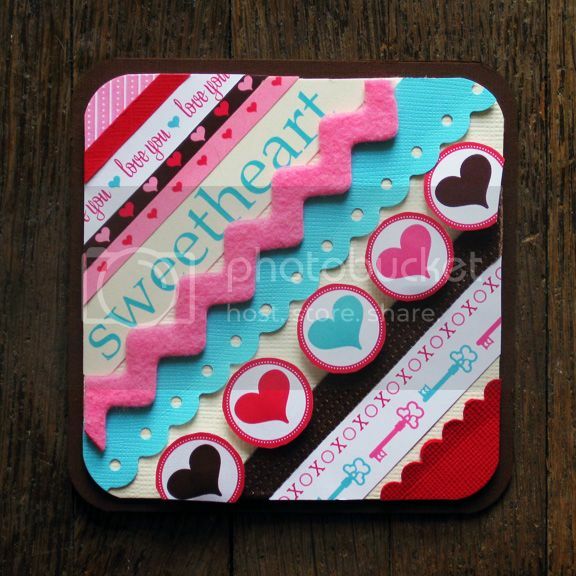 The challenge is to create mini Valentine cards or treats using the new Valentine products. 1) I watched Win a Date with Tad Hamilton (I give it 2 out of 10, we rented it from Netflix) and Holes (7 out of 10, classic) while making these cards. 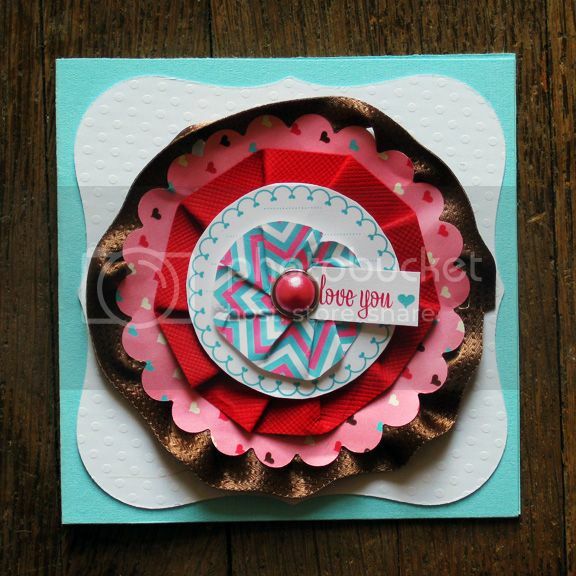 2) To create the flower embellishment I first die cut a large scalloped circle from heart patterned paper, edged it with brown ribbon, pleated a strip of red cardstock into a circle, added a journaling spot, pleated a strip of striped patterned paper into a circle, then secured all the layers together with a pearl brad. Card is 4.25 x 5.5"
1) I cut out nine hearts by hand (it adds a little bit of imperfection which can be a good thing sometimes :) from Valentiney patterned papers and matching cardstocks then I added a little bit of adhesive to a corner of each heart and stuck it in a 3 x 3 grid to the front of a white polka dot embossed card base. 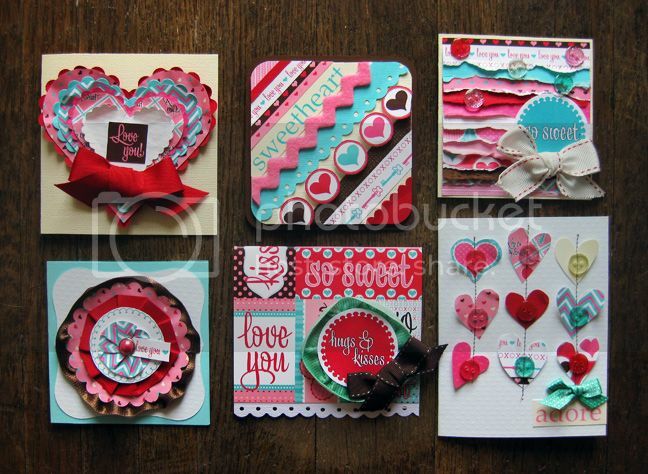 1) I die cut concentric hearts from Valentiney patterned paper and then die cut concentric scalloped hearts from coordinating colors of cardstock, making sure the smallest heart (the one on top) was white so it would contrast with the sentiment to come later. 2) Then I crinkled and folded all the hearts to give them texture (I LOVE this technique right now), then layered them all together, small to big. 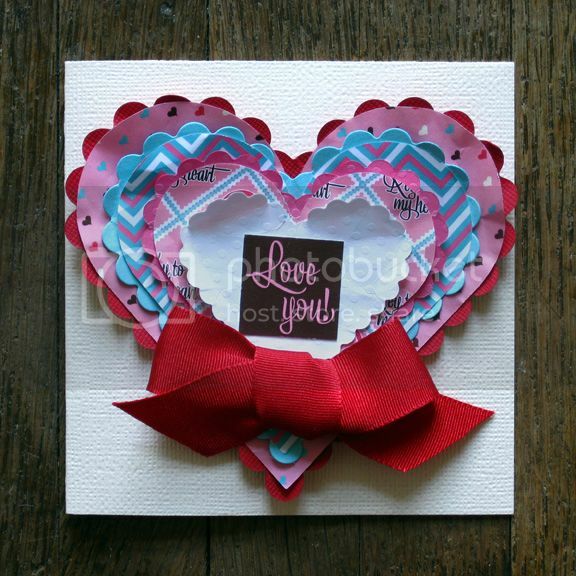 3) Next I cut out a sentiment from a die cut sheet, added it to the layered hearts then set a big red ribbon bow below. 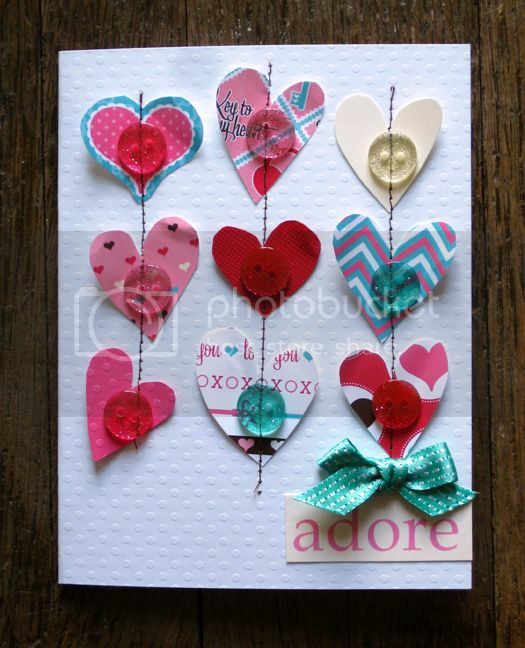 4) Finally, I adhered the entire heart embellishment to the front of a cream card. Card is 4.75 x 4.25"
1) First I made a cream card base. Gotta start somewhere. 2) Next I tore 12 strips of Valentiney patterned paper, cute matching patterned packaging paper, and coordinating colors of cardstock. 3) I staggered all the torn paper/cardstock strips down the front of the card, trimmed the ends so they'd all be the same length, then I sprinkled some matching glitter buttons across the top. 4) After adding a die cut sentiment to the bottom right corner, I tied a piece of white ribbon into a bow and set it below the sentiment. Head on over to the Elle's Studio blog to see more super cute challenge projects made by other design team members and enter to win a $30 gift card to the Elle's Studio shop! Paige these all look amazing! So many great layers! i love the turquoise additions to these cards btw. 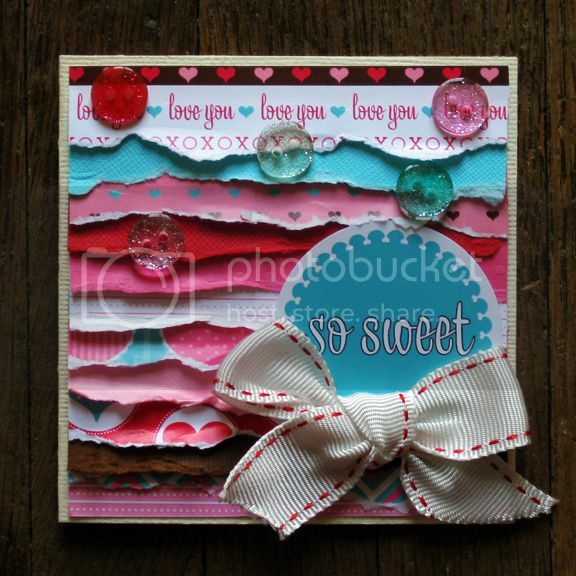 I love the So Sweet card! Good GOLLY your cards are FABULOUS! I love them all. The So Sweet card is my favorite. I am well-pleased with you, Pailge!!! (That means I'm proud of you). dudeeee! those cards are sooooo cute!! and that shirt you made is AWESOME! can i be you? ?